Hands-On Workshops. On-Site Consultations. Instructive Presentations. Many stitchers consider needlepoint a spiritual practice and know how satisfying it is to create or restore a beautiful piece of needlework. At Fancywork Finishing, we work with church ministries and needlepoint enthusiasts to help them take their craft to new levels so they can create gorgeous, handcrafted works of art. 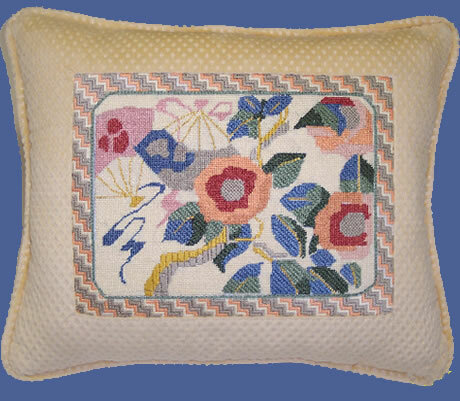 Looking to start a needlepoint ministry or project at your church? 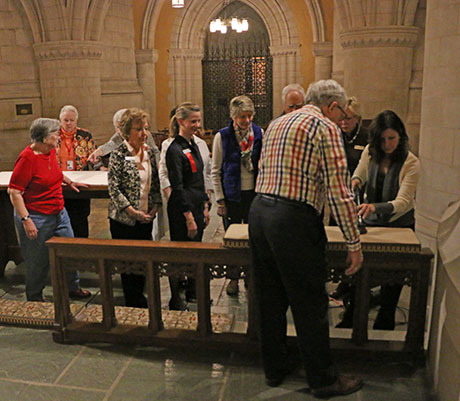 Our on-site consults and classes help altar guilds and church worship committees create, design, and restore ecclesiastical needlepoint. Looking for workshops on how to take your art to the next level? Look at our workshops below. Nancy holds workshops for every level of needlepoint enthusiast — from the beginner to the advanced. She teaches finishing techniques for personal pieces such as knife-edged pillows, boxed pillows, Christmas stockings, and Christmas ornaments that can save you hundreds of dollars in finishing future projects. In every workshop, Nancy teaches her time-tested techniques to help you finish your personal pieces and learn new methods to deepen your skills. Schedule a group workshop in your area, learn without leaving home! Think of needlepoint as something much more exciting and creative than what you saw on your grandmother’s dining room chairs. Our one-on-one instructions will give you the confidence to take on that finishing project. You will leave with written and visual material to support you with future projects. A knife-edged pillow is the easiest pillow to finish. The basic techniques learned in this workshop will be a great foundation to help prepare you for finishing a variety of pillow styles. Even if you have had experience sewing there will be techniques that are new to you. 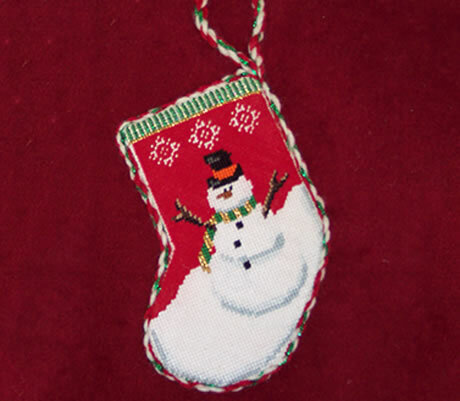 There are many ways to finish a needlepoint Christmas ornament. Nancy will advise you on the best finishing method for your ornament based on the shape of the design and how you intend to display your needlepoint artwork. 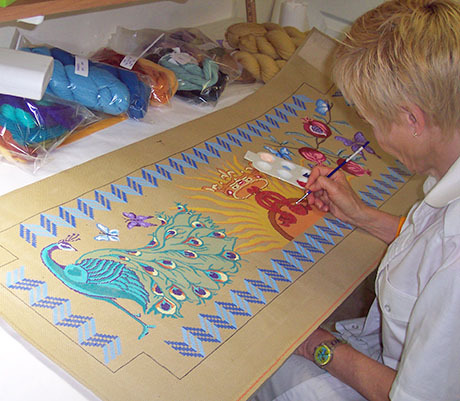 In this needlepoint workshop you will learn which fabrics will perform best, several different embellishments to enhance the beauty of your design, and hand-sewing techniques that create a professionally finished piece. Our founder and owner, Nancy Lukoskie, began her apprenticeship 38 years ago learning finishing techniques for churches. 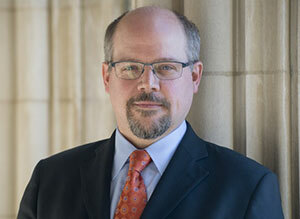 These consultations and workshops are designed to help you begin, restore and learn how to finish your ecclesiastical pieces, and learn new methods to deepen your skills. 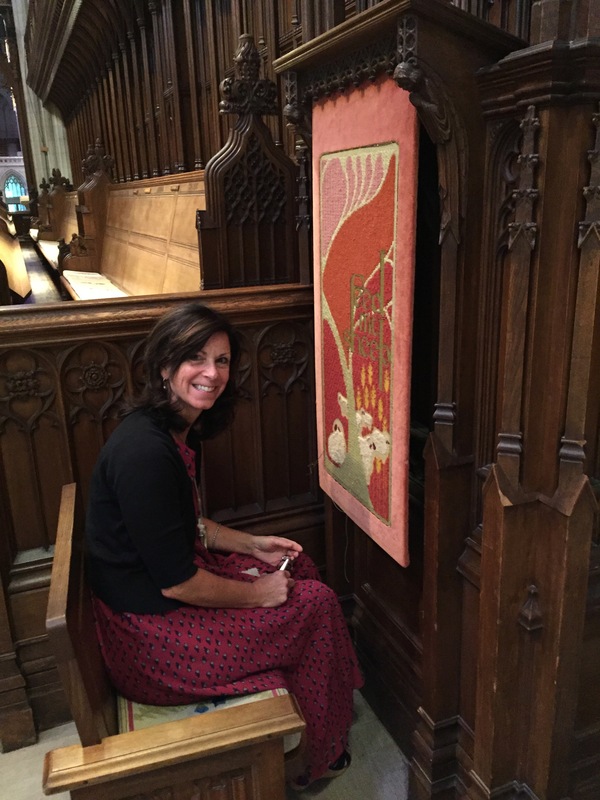 Founder and owner, Nancy Lukoskie, specializes in ecclesiastical needlepoint and has helped bring more than 400 needlepoint projects to life for churches, schools and individual clients over her career. 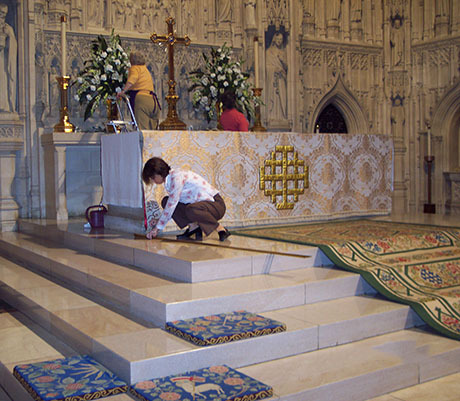 She is a renowned expert and serves as the Washington National Cathedral’s needlepoint specialist. Her work can be found throughout the U.S. and adorns some of the most prestigious and beloved churches in the U.S.: the Washington National Cathedral in Washington D.C., Trinity Church in Manhattan, and the Cathedral of St. John the Baptist in Savannah. She is passionate about supporting needlepoint ministries and enjoys bringing people’s dreams to fruition. Learn more about Nancy and Fancywork Finishing and how she can help your ministry find a workshop that will meet your needs. Hands-on demonstrations of onsite repair-work, cleaning, and regular maintenance. Customized conservation plans with written instructions, schedules, and a list of the materials needed. 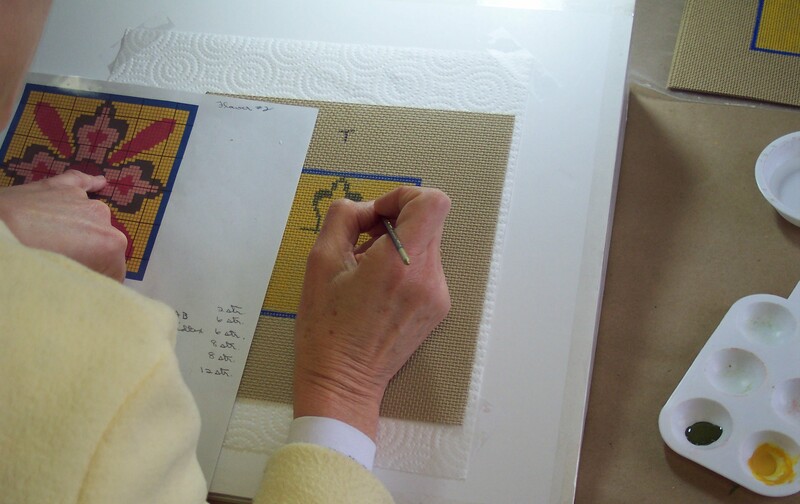 Nancy’s instructional workshops are designed to teach and provide hands-on experience in ecclesiastical needlepoint. 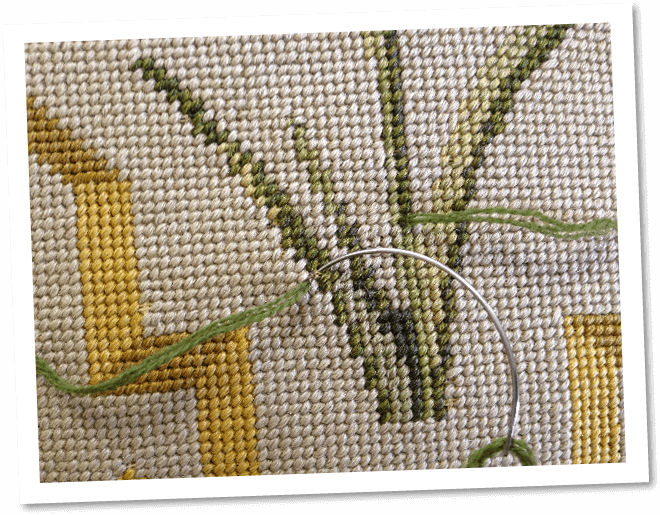 In this professional-level and customized workshop, she offers step-by-step guidance through everything you need to know to professionally start, fit, and finish your needlepoint project. Our founder and owner, Nancy, is a perfect mentor for anyone wanting to start a needlepoint business to support churches. She offers week-long training to professionals seeking to learn the business and craft of ecclesiastical needlepoint planning and finishing. Slide presentations showing her body of work. The process of designing a needlepoint project. How to incorporate symbolism in your artwork. Contact us for more information or to feature Nancy at your next event. 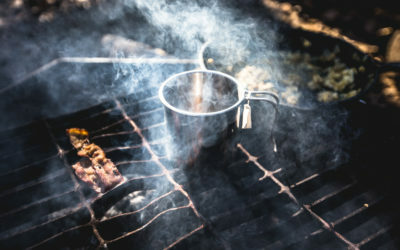 By Master artisan Nancy Lukoskie Do you have stitches that are popping out of your canvas because the thread was not anchored securely, the fibers have worn away, or a bug decided to nibble on your canvas? Download my 7 simple (and time-tested) steps to fix this problem - and the best part is that you will not have to disassemble the finished piece!